Gareth with his "Jewel Net of Indra" installation. Photo: Saglara Kitchikova. 2012. 2011 was a great year! Highlights included my installation "Jewel Net of Indra" for Come Up To My Room at the Gladstone Hotel in Toronto, and my solo exhibition "Floating World" at Loop Gallery, Toronto and a public library gallery in Montreal. For the whole year I've been working as Festival Curator getting organized for the 2012 World of Threads Festival. In 2011, with Dawne Rudman, I published a total of 45 "Weekly Fibre Artist Interviews". In May I went on a trip to London, England and had a fabulous time. This year I taught three courses at Central Technical School's night school, Abstract Painting, History of Modern Art and Paint the City. I've also continued my film project from last year "52 Films in 52 Weeks." At the bottom of the newsletter is what's coming in 2012. Photo: Agata and Lucas Piskunowicz, 2012. Jan 27 - 29, 2012 I showed my installation at the Gladstone Hotel for Come Up To My Room 2012. The event was really successful. This was my main project for 2011. I'm very proud of this installation because I was able to grow as an artist from a technical point of view and conceptually. The process was very challenging and enjoyable as I painted and listened to "The Great Courses" dvd series at the same time. Jewel Net of Indra installation is a cosmology representing the interconnectedness of humanity. It is based on a Mahayana Buddhist metaphor of an infinite net of jewels, each representing an individual. Every jewel is a reflection of all others. 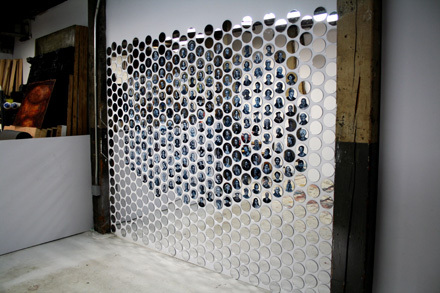 It was a wall installation with one thousand acrylic mirrored discs. 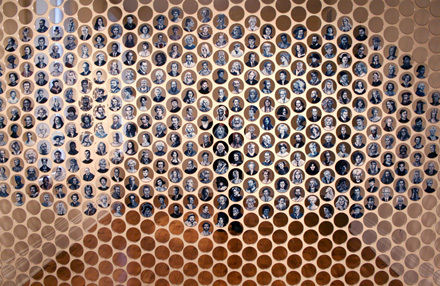 Three hundred and twenty-five mirrors contained hand-painted miniature portraits of iconic individuals. 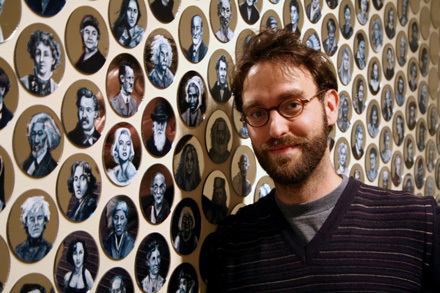 In 2012 I'm expanding the piece to 2000 portraits. For this work I was interviewed for the Toronto Standard and featured on the CBC, Radio Canada, Toronto Life, View on Canadian Art, Torontoist, Fashion Magazine, Moco loco, and Display Design Magazine. The installation received a Designlines "Love Tag" marking the top 100 from Toronto Design Week. 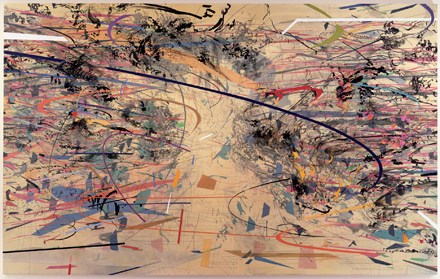 My "Floating World" painting series was an existential response to the horrors of the Japanese Tsunami. It was exhibited first at Loop Gallery, an artist Co-op in Toronto where I became a member. I showed from June 25 - July 17. 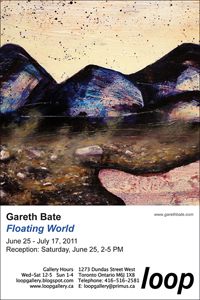 I had the opportunity this January to remount "Floating World" in Montreal. World of Threads Festival Logo, Gareth Bate Design, 2009. I'm currently working as the Festival Curator along with Dawne Rudman on the 2012 World of Threads Festival. We are expanding into Toronto and also remaining in Oakville where the festival began. The next festival is Nov 9 - 25, 2012. 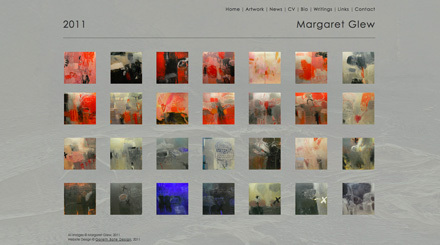 In 2012 I will be curating five "Common Thread International" exhibitions at various galleries in Oakville. Every week for the last year, along with Dawne Rudman, I've published a new "Weekly Fibre Artist Interview". For 45 weeks we have been profiling local, national and international fibre artists. 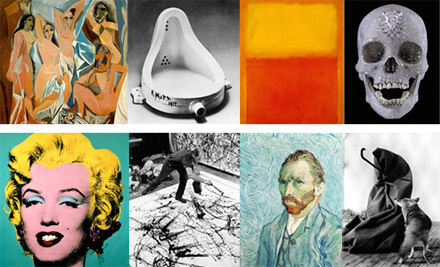 The aim is create a comprehensive archive of the most exhiting fibre artists in the world. Cumulanibus 2011 #1, Gareth Bate, photo.North Lake, Prince Edward Island. I've been working on this photography series for 5 years now. Every August I stay at North Lake, Prince Edward Island and photograph the shifting skies over the lake in every weather condition. Every photograph is the exact same scene with radically different skies. I'm amazed by how different each year has been. 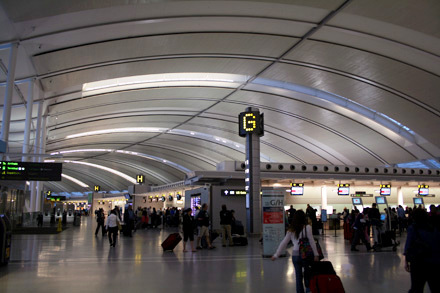 Pearson International Airport, Airspace Gallery, Terminal 1, "Weather,": I exhibited a triptych from my "Moments" series of paintings. Gallery 1313, "Courvoisier Collective Gallery Award Winners Exhibition": I exhibited a graphic photomontage piece called "The Factory" a commentary about Toronto's G20 police force which was based on the iconic photo by Richard Avedon called "Any Warhol and The Members of the Factory." Video: Part 1 of the Up Series: 7 Up. Video: Trailer for The Tree of Life. Last year I started a project to watch 52 films in 52 weeks. This year I focused primarily on documentaries. Overall my favourite was The Up Series which follows a group of British seven year olds. It revisits them every seven years for their entire lives. I've also discovered the amazing dvd series The Great Courses university lectures on a huge variety of topics. I loved the films Tree of Life by Terance Mallick and the classic All About Eve. The Up Series: 7 Up to 49 Up, Kenneth Clark's Civilisation, How Art Made The World, The Power of Art, The Genius of Charles Darwin, Hoop Dreams, Encounters at the End of The World, A History of Britain, The Atheism Tapes, Brother's Keeper, The Thin Blue Line, Spellbound, Maya Lin: A Strong Clear Vision, The Cave of Forgotten Dreams, Exit Through the Gift Shop, Art21 Season 5. The Great Courses: The Meaning of Life, Biological Anthropology: An Evolutionary Perspective, Science and Religion, Alexander the Great and the Hellenistic Age. The Tree of Life, All About Eve, Doubt, Poirot: Murder on the Orient Express, The Tudors: Seasons 1-4. In May I took my first trip across the Atlantic in nearly 12 years! I loved London and saw a ridiculous amount of art. For much of the trip we rode around on buses all over the city. Seurat's "Bathers at Asnières" was really striking. I had forgotten how beautiful and impactful the Impressionist work really is. After seeing all the work before that era it was like suddenly being able to breath again. The Portrait Gallery: The Tudor portraits are truly remarkable. They have all the trappings of royalty yet seem to convey a deep inner psychology of their sitters including Queen Elizabeth I, Mary Queen of Scots and Henry VIII. The Saatchi Gallery: "The Shape of Things to Come: New Sculpture." I was impressed with the vitality of this show and how exhiting it was. I especially loved David Altmejd's and Folkert de Jong's pieces. Richard Nagy Gallery: "Egon Shiele Drawings." Over 60 Egon Shiele drawings in one small commercial gallery! And all for sale! The Tate Britain: This was probably my favourite museum experience because it was empty! I particularly loved seeing again Mark Wallinger's stunning video piece "Threshold to the Kingdom". Projects include exploring a neighbourhood you've never visited, the neon lights of the city at night, interiors of bars, cafes and restaurants and creating collages out of urban materials. 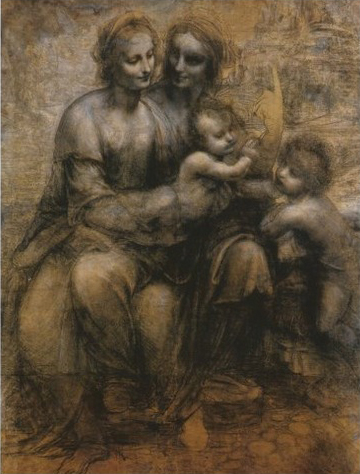 Students are introduced to prominent historical and contemporary urban painters. Sharon Barr, Nadia & Co: Art & Pastry. In process shot of "Jewel Net of Indra." My studio at 401 Richmond St. West, Toronto. Studio: I'm going to expand "Jewel Net of Indra" into a large-scale installation with 2000 portraits. 52 Films in 52 Weeks: Year 3: I'll continue to watch The Great Courses DVD series of university lectures. 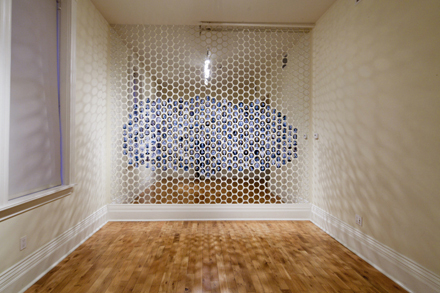 Installation: "Jewel Net of Indra", for Come Up To My Room, The Gladstone Hotel, Toronto. 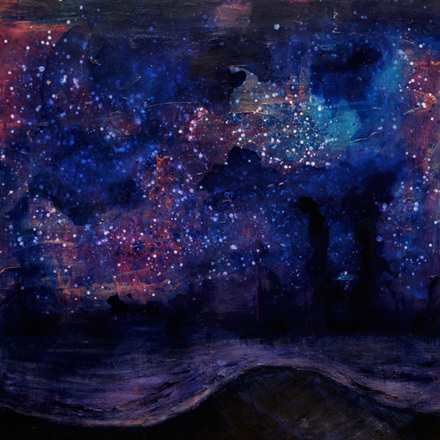 Solo Show: "Floating World", Eleanor London Côte Saint-Luc Public Library, Montreal. Jury: Hard Twist 7: Touch Me, Feel Me. I'll be helping to choose the work for the Gladstone Hotel's annual fibre exhibition. Prince Edward Island: I will be returning to North Lake where I go every year for inspiration. I'll be continuing the "Cumulanimbus" photo series. I will be curating as many as five Oakvile exhibitions including De rerum natura (On the Nature of Things) at Joshua Creek Heritage Art Centre, Momento mori at The Gallery at Sheridan Institute, and the Outdoor Environmental Fibre Instatllations.It will be a huge amount of work, but I'm excited.